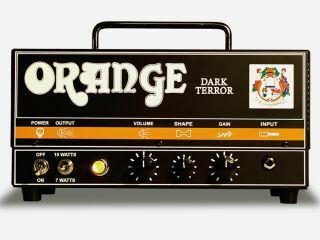 Musikmesse 2011: Orange Amps has announced a new addition to its Terror amp range, the Dark Terror. The 15-Watt head is Orange's highest gain Terror yet. It's available at the end of May 2011 for £399 with, as the name suggests, a black finish. Scroll on for the full details from the press release and take a closer look at the Dark Terror here. Menacingly small, easily recognisable, this aggressive little amp comes with a mind blowing sound which combines the shape control of the Thunder series with the weight and size of the monster Terror family. This Frankenstein like amp has creepy amounts of gain on tap with disturbingly pleasurable responsiveness. It is uncompromisingly brutal, doubtless unhinged, even ferocious! The Dark Terror is available from the end on May 2011 and priced at £399 (inc. VAT). Hear its distinctive Orange Amp sound and you will feel this mysteriously attractive force pulling you into the shadow of the Dark Terror. It's everything you want from a Black Orange Amp. Prepare to ride the Dark Terror storm.